Another weekend, another harvest! It's that time of year where allotments can quickly get overrun with produce, which is no bad thing for the urban gardener! This August has seen plenty of rain in London, as well as plenty of muggy weather, which has been perfect for the London Vegetable Garden allotment. As stated before, getting to and from the allotment takes planning – and usually involves a 7k run! - so the fact that nature has been watering my vegetables for me has been a big help. As you can see, my onions have now been harvested and I shall be drying these out back at home. I'm getting good numbers of 'Golden Sweet' tomatoes, which are very tasty indeed. The rest of the tomatoes on the London Vegetable Garden are plumping up and heavy trusses are forming, which, following last years experiences, shows that it won't be long until I'm enjoying handfuls of fresh tomatoes each day! Also, if anyone has any useful recipes involving runner beans, please do leave a comment on this post – as you can see I need lots of interesting and unusual ideas! This time of year often leads to inactivity on gardening blogs – the London Vegetable Garden included. Why? Well, in respect of myself, there's been holiday, busy times at work, lazy evenings walking along the river and even a rounders night thrown in. But the main reason for inactivity on the London Vegetable Garden over the last month has been... plenty of activity on the allotment! The busy days of digging beds, sowing seeds, battling pests and constructing cane tents have now been replaced by solid vegetable growing. Over the last few weeks, I have been jogging to the allotment a few times a week and conducting brief visits, which seem to consist solely of watering the plot (it's been very hot down in London) and harvesting the vegetables. Obviously this has been so rewarding for me. Whilst I really gained a sense of excitement from managing to grow edible produce on the London Vegetable Garden balcony last year, this summer has enabled me to grow crops of a much more significant size. I may not be harvesting anywhere near enough to avoid shopping for vegetables at Tesco, but I am managing to bring home decent amounts of produce that contribute to a meal or two. 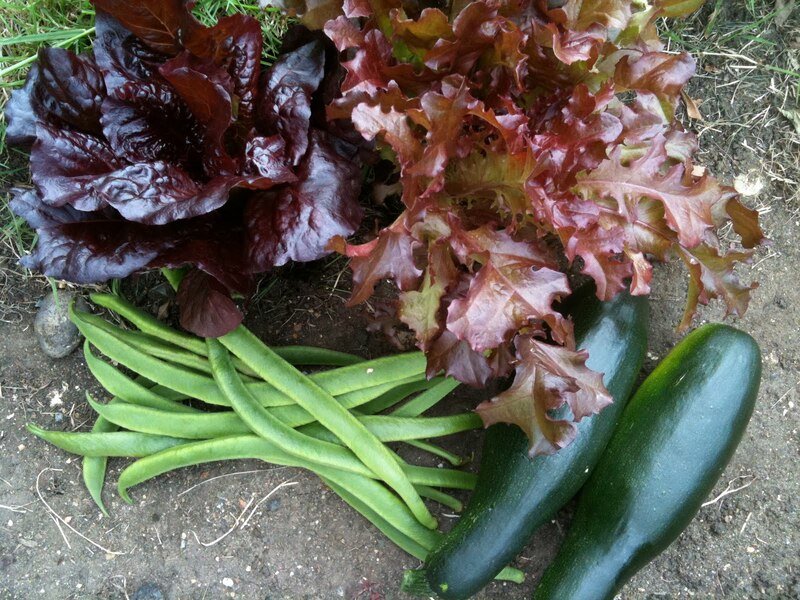 Here are some pictures of my recent harvests – I shall update you all on the tomatoes and cucumbers when I have news!